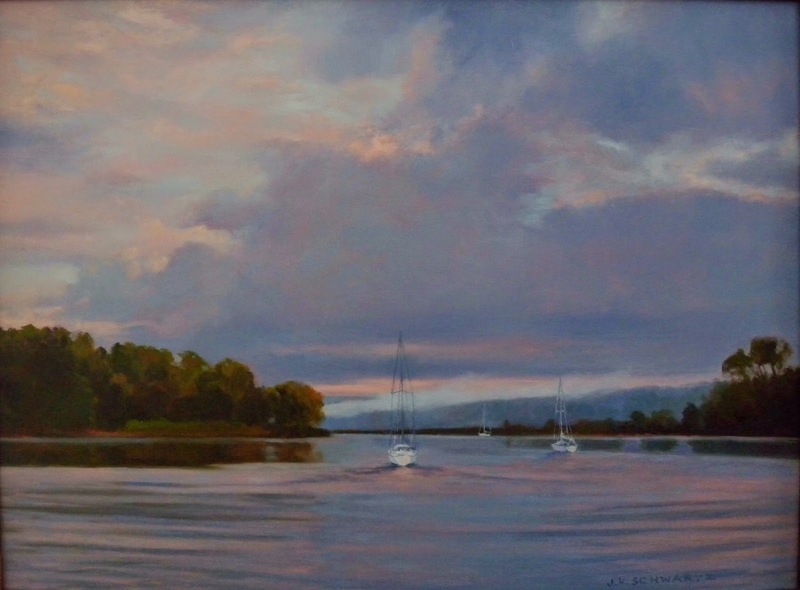 Here are two more paintings inspired by the same morning in Ithaca New York as "Leaving the Inlet" from yesterday's post. As I explained, I was in a launch heading from the inlet leading from the Cornell Boathouse out to lake Cayuga. The latter is one of the famed Finger Lakes , five glacial lakes spanning a number of states. The region is beautiful! There are gorges, waterfalls, meadows and vineyards. Ithaca is a charming college town where both Ithaca College and Cornell University are located. I have close family connections to both institutions and visit here at least once a year. So how do I create these paintings at home in the studio? I had taken LOTS of photos from the launch. I ended up deleting at least half of them and kept only ones that had an element of what I found so striking that morning. There were heavy clouds breaking apart with the glow of the rising sun showing through. There was mist, a lot of mist lending an air of mystery and softness. It was late September and the fall color in this northern region was well underway. It was cold! The painting above was created by taking elements from three separate photos. I wanted to have a few of the Cornell buildings poking through the mist at the top of the hill because I knew I wanted to title this "Above Cayuga's Waters" and that is from a line of the Cornell alma mater. I wanted a sense of the cold with the warm light of the sun promising warmth. 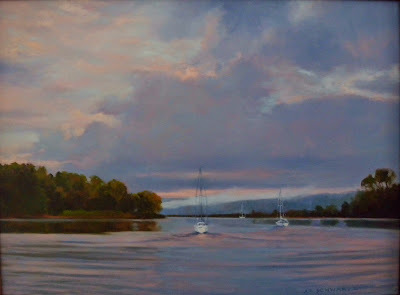 I did several sketches before starting work on this as well as "Daybreak on the Inlet", 20x16 oil on panel pictured below. 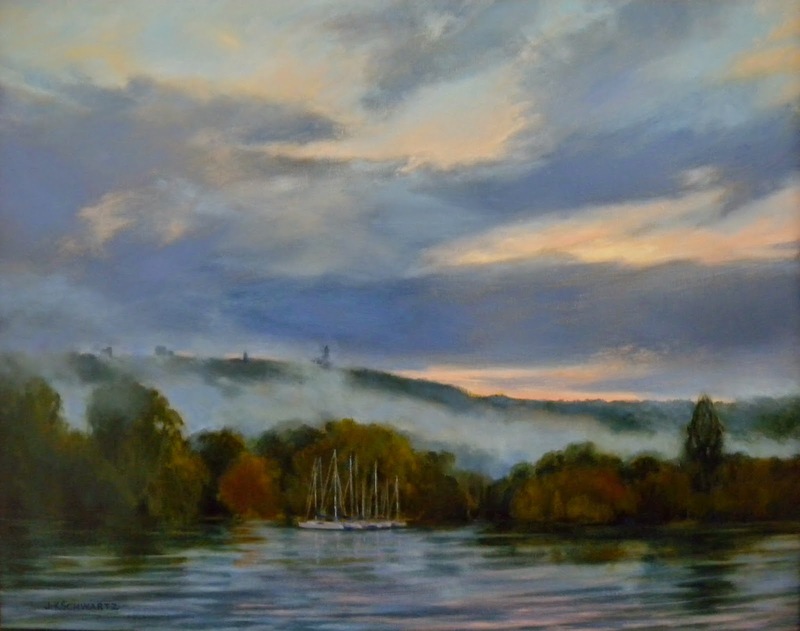 In the latter I chose to depict just one of the sailboats moored at this small marina. The single vessel seemed more significant in the moment depicted. I also experimented with a very heavy texturing of the panel in this one and I liked it! The annual Grand National Exhibit sponsored by the American Artist's Professional League (AAPL) is a show I look forward to entering every year. I am happy to be participating for a fourth year in a row and my painting "Leaving the Inlet" is my contribution to this year's exhibit. The show opened on Monday and runs until November 21st in the Main Gallery of the Salmagundi Club at 47 5th Avenue NYC. You can view all the works in this show (and they are impressive!) at the AAPL website www.americanartistsprofessionalleague.org. The painting depicts dawn on the inlet leading from the Cornell University Boat House on lake Cayuga in Ithaca New York. The sail boats are heading from their inlet moorings out to the wide waters of the lake. I was on the crew coach's launch following these boats out the inlet to view crew races. The sky was magnificent! Yesterday I created a business page on Facebook and if you are a FB follower I hope you will visit the page and take a moment to like it, if you do :-) and leave comments on the posts. Feedback is always helpful. 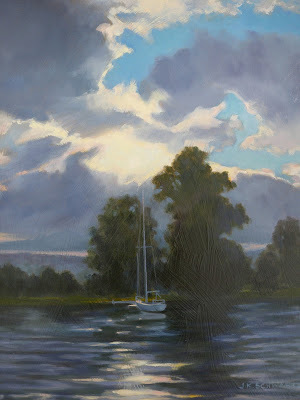 I will be posting paintings, plein air experiences and exhibit announcements there. Here is the link...www.facebook.com/jeanschwartzstudio I hope to see you there!